The Permatang Pauh by-election campaign kicked off in earnest with four candidates submitting their papers at the nomination centre here on Saturday morning, although one later pulled out. At 11.45am, returning officer Roslan Yahaya announced there were three candidates contesting the seat: PKR adviser and de facto leader Datuk Seri Anwar Ibrahim, Seberang Jaya MP Datuk Arif Shah Omar Shah and Angkatan Keadilan Insan Malaysia (Akim) president Hanafi Hamad. An independent candidate Dr Mansor Othman, former Penang PKR leader, had also submitted his nomination but later withdrew, losing his RM15,000 deposit in the process. Anwar Ibrahim submitted his form at about 9.15am, while Arif Shah submitted his about 15 minutes earlier. Dr Mansor said his nomination was a strategic move by Pakatan in the event Anwar had been disqualified. Arif Shah, who arrived at the nomination centre at 8.42am, was accompanied by Barisan Nasional leaders Umno deputy president Datuk Seri Najib Tun Razak, Umno Youth chief Datuk Seri Hishamuddin Hussein, MCA vice-president Datuk Ong Tee Keat, Wanita MCA chief Datuk Dr Ng Yen Yen, MIC president Datuk Seri S. Samy Vellu and others. Also accompanying him were Gerakan acting president Tan Sri Dr Koh Tsu Koon, who is also Penang BN chairman, Wanita Umno vice-head Datuk Seri Shahrizat Jalil and Umno information head Tan Sri Muhammad Muhamad Taib. Anwar was accompanied by his wife, PKR president Datin Seri Dr Wan Azizah Ismail, and three of their children. Also with him were Penang Chief Minister Lim Guan Eng, PAS vice-president Husam Musa, DAP chairman Karpal Singh and other party leaders. PAS spiritual leader Nik Abdul Aziz Nik Mat, who is reportedly unwell, was also on hand to lend his moral support. Akim is a PAS splinter party set up in 1995 that claims to have about 10,000 members nationwide. 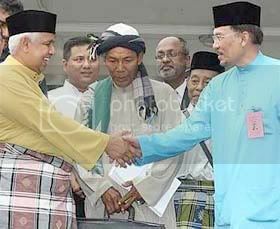 It contested and lost in the Pasir Puteh and Kota Baharu parliamentary constituencies in the 1999 general election. Over 10,000 Barisan Nasional and Pakatan Rakyat supporters accompanied their candidates to the nomination centre at the Tuanku Bainun Teaching Institute in Mengkuang here. Supporters carrying flags and banners started converging on the place as early as 6am and were allowed into the field near Dewan Aminuddin Baki, the venue for submission of nominations, at 8.15am. Pakatan supporters were the first to be allowed in, according to Bernama. They assembled in an area reserved for them, shouting “Allahu Akbar” (God is great) and “Hidup Anwar” (long live Anwar) and waving banners and symbols of their respective parties. BN supporters were allowed in at 8.30am together with Arif Shah. Over 40 policemen in riot gear kept watch over them. While their candidates filed their nomination papers, Barisan supporters sang patriotic songs while Pakatan’s side sang “Allah Selamatkan Anwar, Allah Selamatkan Rakyat Malaysia” (God save Anwar, God save the people of Malaysia) to the Happy Birthday tune. Things got even merrier with Pakatan’s lion and Bangra dances. Many supporters however began to disperse at about 12.30pm when a heavy rainstorm broke. The Permatang Pauh parliamentary seat was made vacant on July 31 when Dr Wan Azizah resigned as Member of Parliament to make way for Anwar to contest. Polling day is on Aug 26.